My answer so far has been sufficient to change the minds of some skeptics and turn others into believers. That’s because not only do we have all the answers we currently need to make Copiosis happen, we also have a viable, practical implementation-and-transition plan that is working today. I had trouble worrying about how this can be implemented, worrying about the “free” needs met and what kind of buy-in that would take in terms of authority/power holders when the really new dimension was the way to calculate the value of what we offer to the society. When I heard about the start-up applications, it made sense and resolved the other questions. Copiosis has a practical, implementable transition plan for moving humanity to a state where Copiosis is the dominant economic system worldwide. This transition plan and understanding how to make it work constitute a major advantage for us. Our transition plan has been tested and used successfully by every single successful innovator and market change agent. This is why I’m convinced it will work. Well, that and the fact that I have a good grasp on how to make it work. Copiosis will achieve its mission without focusing blame on anything or anyone. Without opposing anyone, fighting anything, redistributing other people’s wealth, or trying to pin blame on any single group of people, we can make fundamental change a reality. Understanding how we do this requires a pretty good understanding of the innovation itself, which everyone will come to when the time is right for them. Our understanding of timing as a critical element is another major advantage. We also know how to manufacture what people generally refer to as luck. More on that later. These advantages mean that our innovation makes everyone’s life better, that we have a superior transition strategy, that our strategy has worked more times than you can count, and that we know how to implement the transition strategy. That we understand timing and know how to manufacture luck puts us far ahead of others’ attempts. These advantages, combined with our results so far, make our success much more likely than anything before attempted in this area. I personally believe our success is not “likely”—it is assured. Do you use Facebook, Twitter, Wikipedia, the Internet, Tesla, tooth brushes, shoes, or computers? If so, your behavior, as well as the millions of people just like you who use or are familiar with these inventions as well as billions of other products, services, concepts and ideas, have already demonstrated our transition plan’s effectiveness. Proof that our transition plan has worked is so prevalent that it’s invisible to nearly everyone even though everyone has demonstrated its workability in their own lives and has seen it work in others’ lives. Every time you spend money on one thing over another, believe in one thing over another, or change your behavior as a result of watching or listening to others, you are demonstrating our transition plan’s workability. First, a creator has a burning desire to do something. It is a call of passion that they can not deny. They can’t help but want to make this thing. They know people will love it. This burning passion germinates the massive success to come. Next, they make it. That product, service, concept, or idea can be a simple improvement on something that already exists. In breakout successes though, the creation is a complete departure from normal. It’s an “Ohmygod, where did THAT come from?” innovation that people want immediately. It polarizes the market into those who love it and those who hate it. Not everyone wants it immediately. Just a small number of people loving the thing gets the process started. Those people love the new thing so much, they can’t help but tell all their friends about it. They want to be involved with the product’s adoption and growth. They are compelled by internal forces known only to them to take this action. I currently see Copiosis as one of the most strategically sound direct actions I can spend effort on. I really am glad that you connected with me in the beginning! I have a good feeling that this project will see its way to fruition and that we will be in better times within our lifetimes. Denver G., in a personal email to me. He is working now to bring Copiosis to Spain. Or, if they’re more tentative, they check in with others they trust about it. Before you know it, that creator has an army of people spreading the word about this great new thing. The army gets bigger, word goes farther. Over the next 10 to 20 years, remarkable events happen. These events secular-oriented people call “luck,” “happy accidents,” and “coincidence” for good reason. They seem completely random or magical. That’s not what’s actually happening, but that’s what it looks like to the average person. That’s why the average person (and some creators/leaders) describe these events as “luck,” “perfect timing,” and coincidence. The reality is, these events are not random, and they’re not luck. They can be manufactured. These 10 to 20 years pass without most people noticing anything about the innovation. They are not paying attention to the “incremental-here-then-small-leaps-and-bounds-there” progress the creator, her team, and her small army are making happen. But the creator, propelled by her passion and enthusiasm is keenly aware and consciously shaping events. She’s buoyed by early success. Most creators just have faith these events will happen, and sometimes they do. But for the creator who knows how to manufacture luck, things happen quite differently. Over time, the process described above feeds itself in a virtuous cycle. Then, one day, everyone is talking about this new thing, and the creator is a hero. This creation looks like an overnight success to most people. They don’t recognize the “incremental-here-then-small-leaps-and-bounds-there” because they didn’t go through it. Continue on the path until it’s done. I could go on and on describing the transition process, but that covers it in a nutshell. There are nuances and key conceptual details I have a solid lock on that I could share, but won’t for brevity’s sake. Sharing those details doesn’t matter anyway. Instead, let’s visit some nuts and bolts. In successes, rapid adoption happens once the majority realizes what the minority (the earlyvangelists and early adopters) already know: The new product or service is way better than the status quo. Whether it’s iPhones, Teslas, Priuses, rap music, progressive lenses, electric toothbrushes, spears, guns, machine guns, missiles, or drones, it’s all the same—make something better, and get it in the hands of a passionate few. Give it time, manufacture luck. Don’t give up, and you’ll have majority adoption. 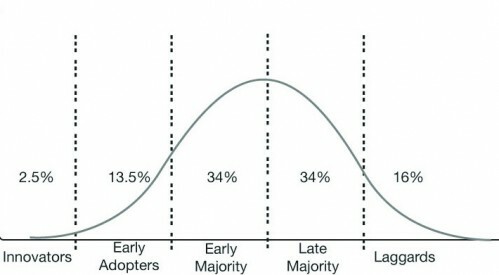 The technology- or product-adoption curve, the heart of our transition strategy. We know how to implement this strategy, and we’re already producing results indicating early success. Other efforts have not understood or consciously used the product adoption curve or the principles that underlie it. We know how to make the product adoption curve work because we understand how to run a startup. We already are producing results consistent with this strategy. In other words, the transition plan is working today. We manufacture our own “luck” and know our process for manufacturing “luck” works. I have pretty good detail in my head of exactly what the transition looks like, but no plan survives the first “engagement.” Flexibility is key. That being said, I outlined these details in a previous post. Here are those same details updated with current knowledge and awareness. Early phase (we’re in this stage now): In this stage we focus on awareness generation, education, and recruitment, while focusing on solution improvement and development. The most common question we get besides “How will you make this happen” is “Have you tried this somewhere?” In this phase we show the system can work by rolling out demonstration projects across the country. Demonstration projects are preceded by “tours” in which people get an emotional immersion in Copiosis. They get to feel what it’s like living in a Copiosis society. The tour also includes a presentation of our transition strategy. In this phase we expect to support an increasing number of demonstration projects across the US. Work in this area will spawn interest for demonstration projects in other countries. At the moment, it appears Spain may be the next country where a demonstration project may occur. As more and more people learn about and experience Copiosis through the tours, more people are wanting to get involved. Those people become part of our army. Their task is to launch a demonstration project in their community. A group in Chico, California is planning to launch their own demonstration project. Media coverage also is a prime component of this phase. We already have demonstrated strong support from community-supported radio stations, which broadcast to an audience that is essentially our latent army. Meanwhile, in this phase we have and continue to refine all the technology needed to run the demonstration projects with the help of Portland State University. We also have successfully recruited enough families willing to participate in our first demonstration project. A local (Portland) award-winning newspaper has begun preparing an article on that project to run some time after the Portland project launches in September. This phase sees the widespread adoption of demonstration projects across the nation, with projects spontaneously popping up in other countries as we gain early traction and momentum. Copiosis transitions to the Entertainment and education phase after we have identified and recruited one to five high net worth individuals (or a satisfactory equivalent) willing to finance progress and includes using high-concept Copiosis events, the media, and info/edutainment to further educate and inspire. The Copiosis “tour” holds great promise as a highly interactive, edutainment event where people pay to have an experience that engenders hope for the future, inspiration, and inquiry. What’s more, we have both a board game and MMORPG in very, very early stage development. This phase continues with subsequent remaining phases. The Political phase of our strategy begins when sufficient heat is generated in public consciousness to merit the attention of pundits, think tanks, lobbies, the mainstream media, and political leaders. In this phase, work begins to counter anticipated vile attacks, outright misrepresentations, and other strategies, including character assassination, people vested in maintaining the status quo will use in their ignorance to try to destroy our work. I say “ignorance” because they (1) won’t have understood the innovation and how it benefits them, (2) their income depends on being contrarian, antagonistic, or ignorant of what we’re doing. I believe that by this phase, public support of Copiosis through demonstration projects, media coverage, our not-so-small army, and our results will be too great to ignore. Public funding is expected to be massive at this stage, enabling us to begin taking action in the political arena, initially at the municipal level, to generate more detailed awareness among political leaders. We also cultivate our own friendly political representatives and action committees and lobbies to do our political work although no legislation is needed until just before the Transition Phases outlined below. Pre-Transition Phase: We convene teams of experts to continue the software and technology development needed to let Copiosis economies work. Much of this technology exists already and just needs to be repurposed to serve the innovation. Other technology we’ll develop in-house. Meanwhile, other Copiosis teams begin working on the process of compensating people with investments in tangible market assets as well as financial securities, thereby eliminating debt once and for all for everyone. We already know how to do this. We also begin working with other nations to smooth the transition for them (assuming they aren’t transitioning themselves). The Payer Institute, the organization founded to train members of the Payer Organization, is formalized. By this time, it has been training people to act as payers in the demonstration projects on an informal level. We’ll be creating the Payer Institute as we launch the Portland demonstration project (Kenton) in September. The Pre-transition phase ends with the passage of the Copiosis legislation, which we have drafted already but will likely change as we gain understanding of relevant subjects such as Constitutional law. Transition Phase: In this phase, the entire nation (or nations) begin to deploy Payers, distribute software to transform existing mobile devices (if that hasn’t happened already) so those devices can interface with the Copiosis system (mainframe and other elements such as accepting and recording transactions and declarations) and continue other work that got underway in the previous phases. Legislation and newly formed organizations assist with the transition to the Copiosis economy. Post-Transition Phase: Mop-up activities take place here. There will be glitches needing attention (e.g., the Affordable Care Act implementation). There will be uncertainty and conflicts, which we hope to address in the Pre-Transition phase. In this phase we follow-up on the transition, monitor progress, and fix what isn’t working. We suspect this will mostly be adaptation issues of individual human beings and groups of human beings rather than institutional and infrastructure issues. That’s the gist of our transition strategy. We’re creating something people get emotionally connected to, and we’re going to win. Period. Is this plan working now? By what I can see, it is. We have a growing army, we have successful strategic alliances with key media so far, our education and outreach are increasing in effectiveness. Meanwhile, our demonstration projects continue to develop. We have functional software using a functional algorithm we believe works. We have concepts, values, and disciplines guiding our organizational culture. We have all the elements in place and they are all working. If you don’t believe our transition plan can work by this point, if you disbelieve, doubt, or are skeptical, watch and see. Please visit our Patreon page and consider becoming a patron of our work. *That’s a catchy headline. 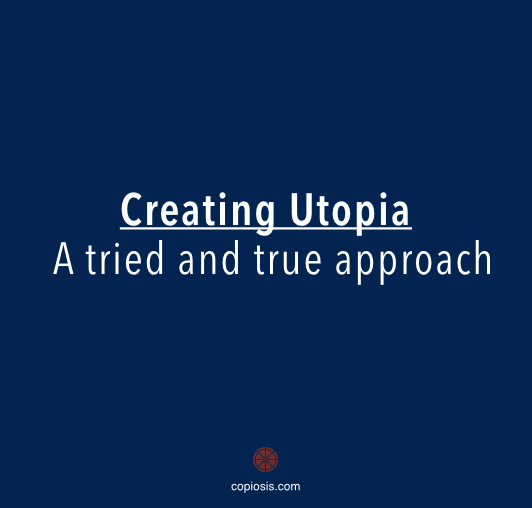 We’re not creating Utopia. There’s no such thing. I do believe Copiosis is the closest practical analogue to a Utopia humanity has devised to date. It’s not Utopia, but it’s close. « What is anti-business anyway?